It is important to seek advice from an Occupational Therapist with regard to sensory circuits. For more advanced activities, like the use of weighted blankets an OT needs to be advising you on their usage. 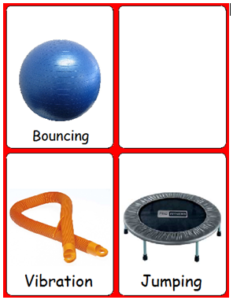 Sensory circuits need to be carefully planned activities and should always include an organising activity, for example lying on a yoga ball whilst building blocks or following a set of instructions, like a game of ‘Simon Says’. Usually sensory circuits are visually supported with a now/next board. 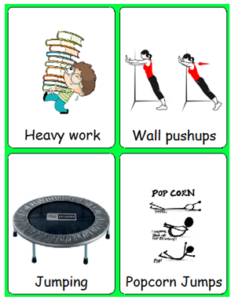 Each activity should be timed or counted, use a timer or a countdown to visually represent this to the pupil. The child places their palms on top of their head and press down (described as squashing himself into the floor) with even pressure for a count of 10. Using a ball, (foam or squishy one) get the child to hold it between two flat hands in front of his chest. Squash the ball as hard as possible to flatten it and hold for a count of 10. Push against a wall or down against a desk for a count of 20. Complete activities encouraging the child to lie on their tummy propping on elbows. Chewing crunchy food: apples, popcorn, nuts, orange etc. Drinking thick fluids from a straw/ exercise bottle. Pour out dry beans from a tin. Apply deep pressure to calm (big bear hugs on shoulders and limbs). Looking at a book/ pictures with an adult. Getting up and down stairs. Sit on Move n’ Sit cushion or therapy ball. Fidget with a Fidget cube, paper clips, rubber bands, straws, thera-band, small figurines, marbles etc. Stroking rough textures or soft textures.